A resource for enthusiastic beginning quilters and crafters and those quilting and crafting with a purpose. The journey is as beautiful as the destination. Won't y'all join me? 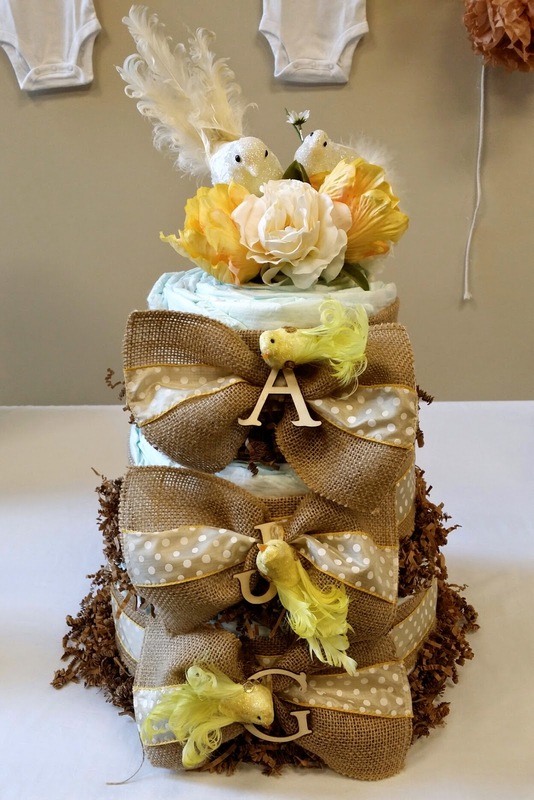 When I decided to make a diaper cake for a friend's baby shower, I looked at many tutorials on the web and Pinterest. I found many that claimed to be easy, but when I tried to follow them, I encountered several problems. My main issue was rolling up the diapers without someone else to help me hold them in place. Through much trial and error, I came up with a way to hold onto them while working on my own. Line several diapers up in a row, front side up. 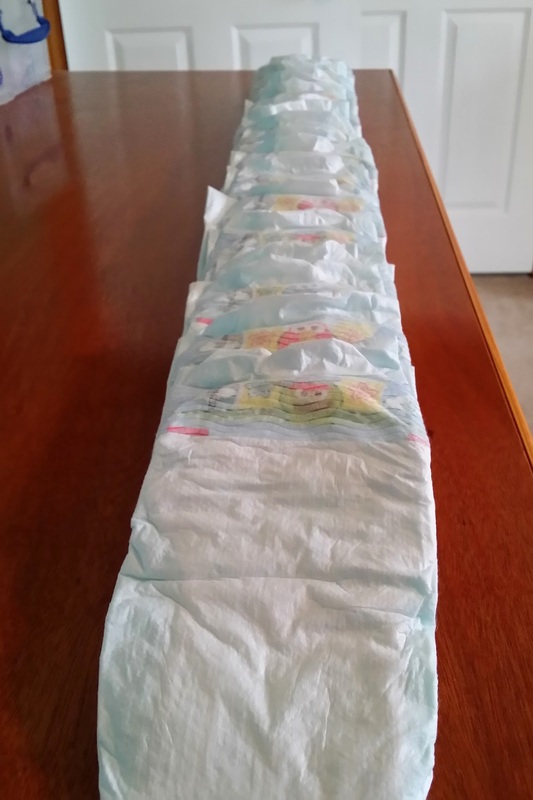 All the diapers should be facing the same direction. Place the top of each diaper just below the pattern of the diaper behind it. 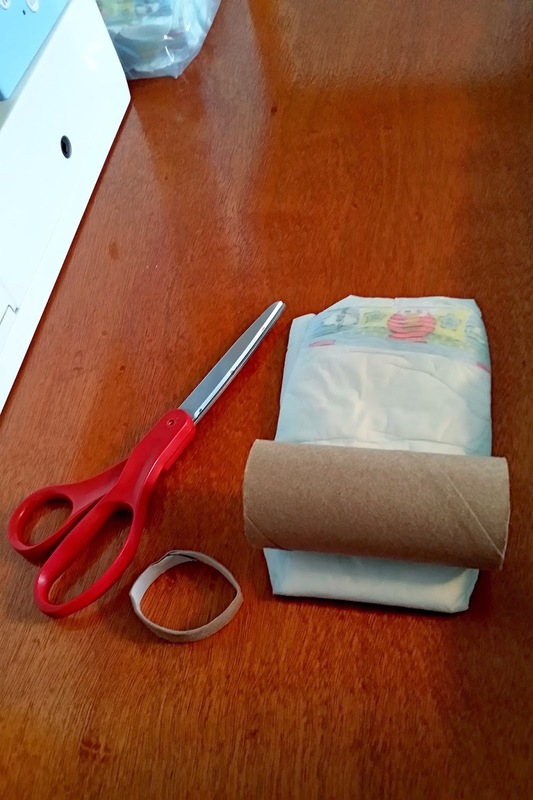 Cut a toilet paper tube slightly larger than the width of a diaper. Next, place the cord or yarn beneath the line of diapers. Leave the cord/yarn on its spool/roll. Take the free end of the yarn and run it through the center of a toilet paper tube. Place the toilet paper tube onto the row of diapers at the top end of the row. 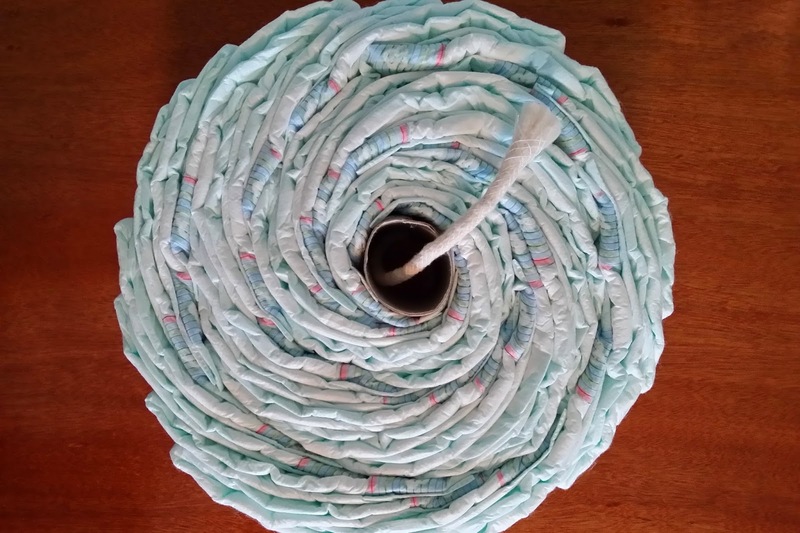 Roll the toilet paper tube along the row of diapers. The cord/yarn will allow you to keep the diapers from falling off the tube as you roll it. Be sure to adjust the diapers as you roll to keep the diapers straight on the roll and evenly spaced around the tube. 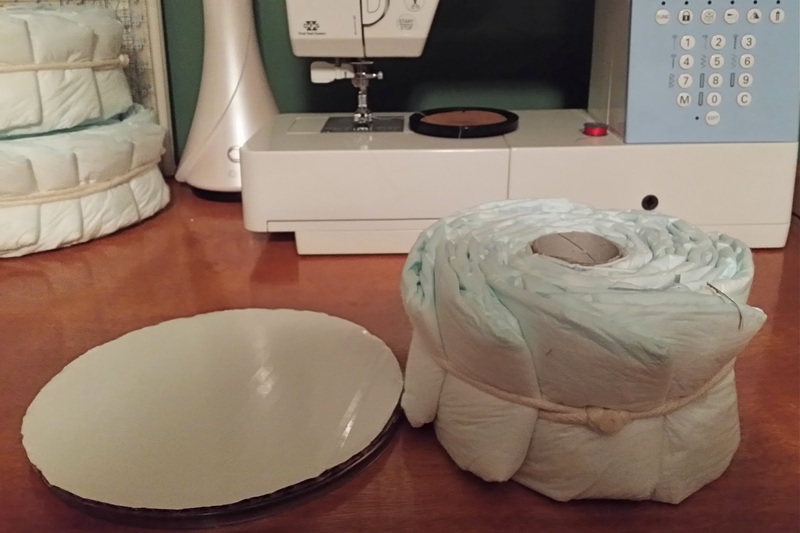 Periodically measure the diaper roll, adding diapers until you reach the desired thickness for the cake layer. 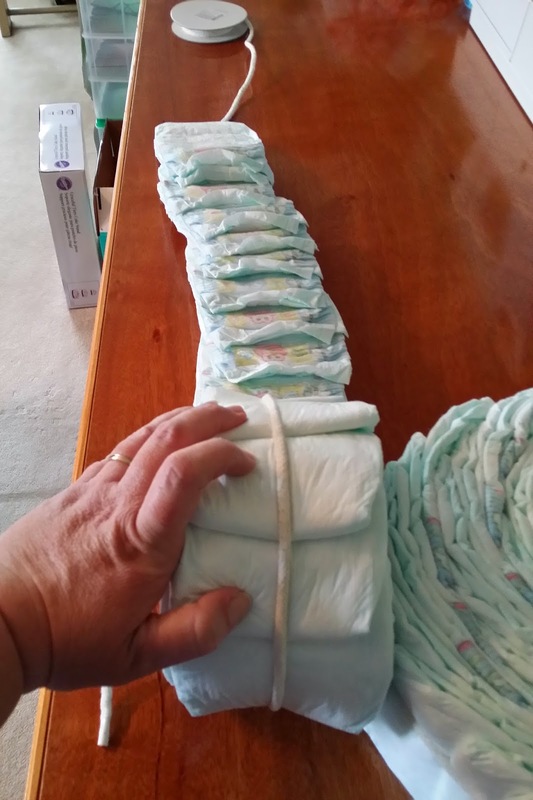 Make sure diapers on the outer edge are evenly spaced around the layer. Cut the cord/yarn, leaving several inches at the end. Tie the cord/yarn so that the diapers remain securely in place. Trim the cord. Trim the toilet paper roll even with the outer edge of the layer. Cut a piece of cardboard into a circle 2 inches larger than your layer. Place the cake layer on the cardboard circle. 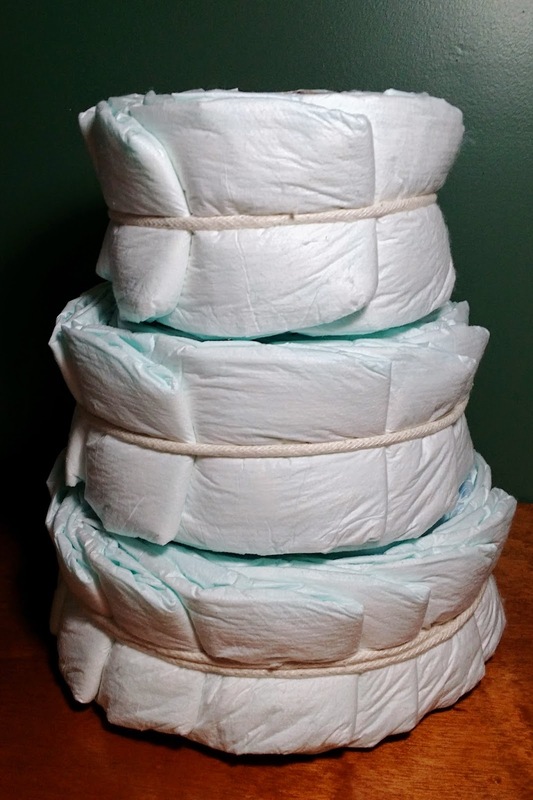 Repeat until you have the size and number of layers you need for your diaper cake project. Decorate you project as desired. Happy crafting! Bama Quilts and Crafts. Simple theme. Theme images by Ailime. Powered by Blogger.